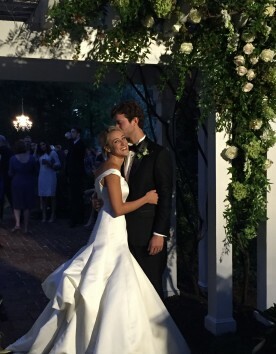 So Hillary is now Mrs. Charlie Blakeley, and the wedding was perfect. And one of my travel-weary relatives, who got to town too late to make it to the rehearsal dinner, let himself in to what he thought was his rental cottage and climbed into what he thought was his bed. Turns out, he was wrong on both counts (as both he and Charlie’s aunt discovered, much to their mutual surprise, later that night). But things like these are minor details. Nobody noticed or cared. (Well, nobody except Charlie’s aunt, but I like to think hers was an extenuating circumstance.) 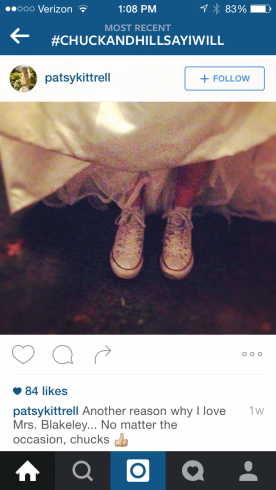 And if I’ve learned one thing after throwing two weddings in four months, it’s that no wedding is perfect. At the end of the day (like, as in the literal end of the day, when your husband lies next to you in bed and asks if you baked that wedding cake by yourself), it’s all about grace. I know that (in my head, anyway) but it’s a lesson I learned all over again from watching Hillary’s cousins, the flower girls. During the rehearsal, Anna Joy and Elizabeth had been told exactly where to stand. The wedding guild gal even taped quarters to the church floor, promising the girls that they could claim them if they stood on the “treasure” the next day, during the ceremony. Come show time, the girls nailed it: They made it down the aisle, found the quarters, and planted themselves. 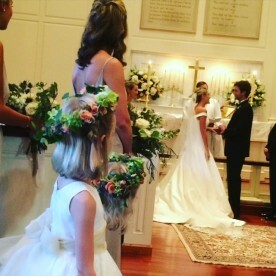 Everything was perfect – until Hillary and Charlie moved up to the altar to say their vows. At that point, the girls could no longer see what was happening. And whether it was out of obedience or avarice (to an almost-five-year-old, a quarter looms large), Elizabeth was definitely not willing to move her feet. She leaned over as far as she could, straining to catch a glimpse of the action, until I was sure she was going to topple. And, in the “Lessons for the MOB” category, I’d venture to say that grace is probably the single most important thing that a bride’s mother needs. (Especially a bride’s mother who happens to be a perfectionist, like some people.) Because here’s the thing: You work like crazy to pull off a beautiful event, and you want it to be “just right.” And when it’s over, you fall into bed, happy and exhausted. You think about how pretty your daughter looked, right down to the “perfect” Tory Burch heels that you found to go with her dress. I love my girl. And I love God’s grace. Because when it comes to throwing a wedding (or doing anything in life), it’s really the only thing that is perfect.